The Dayton, Ohio area is rich in aviation history…you may have heard of two brothers named Orville and Wilbur who were credited with inventing and flying the first successful airplane back in 1903. 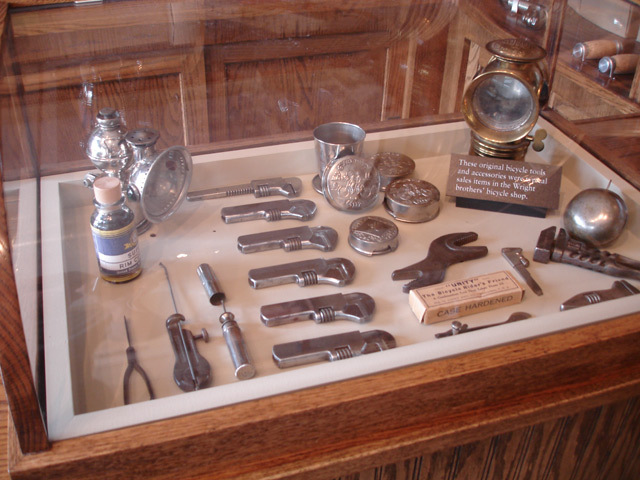 Those brothers, the Wrights, did all their design work and much of their testing right here in Dayton. And do you know where they did their inventing and brainstorming, fabrication and planning? 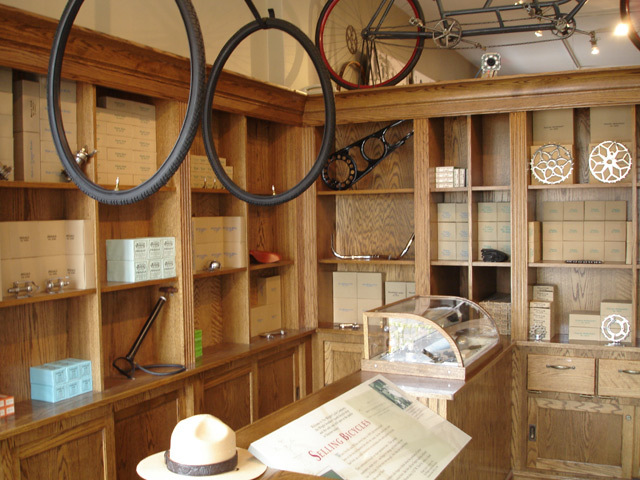 That’s right, their bicycle shop…in addition to a number of other businesses, the Wright Brothers built their own line of bicycles and were able to fund their aviation experiments using the proceeds from their bike shops. Also, they recruited their shop employee/mechanic, Charlie Taylor, to help fabricate parts and the first motors used in their flying endeavors. So, it’s fair to say that bicycles were partially responsible for aviation as we know it! 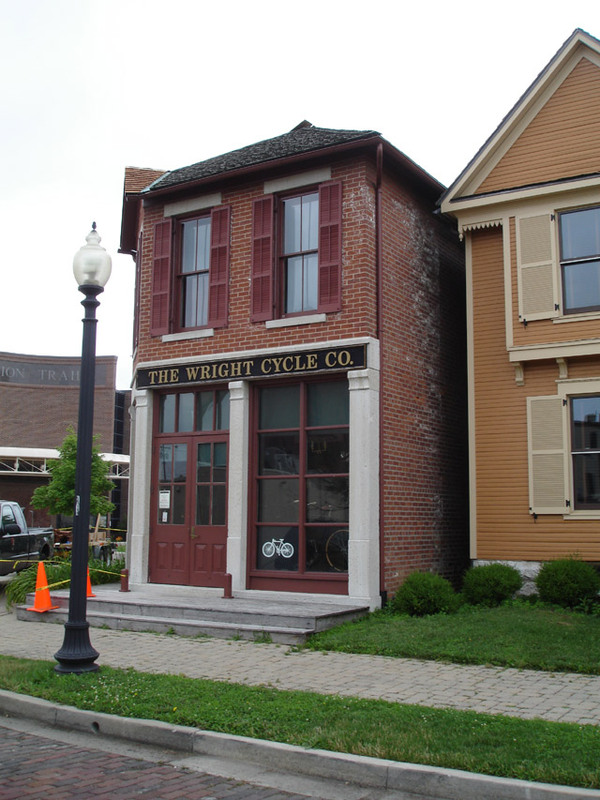 The Wright Cycle Company occupied five different storefronts, most roughly within a block or two of each other, and only one remains in its original location at 22 South Williams Street in downtown Dayton. 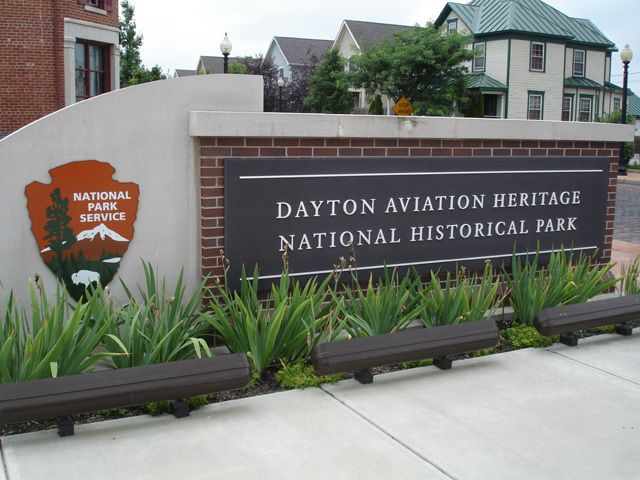 That location is part of the Dayton Aviation Heritage National Park, and I took a trip there a few weeks ago to take photos to share with you. Let’s take a look at the shop, shall we? 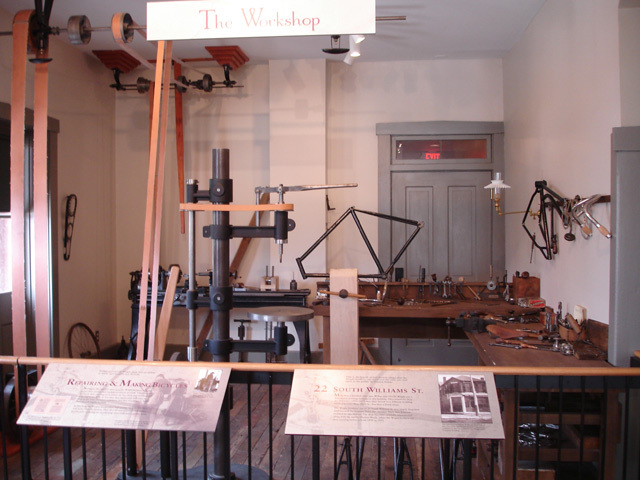 The Wright Cycle Company is part of the Dayton Aviation Park complex, which also contains an interpretive center, a replica of the Wright Brothers’ printing shop and a memorial to noted African-American poet and essayist Paul Laurence Dunbar. Dunbar was a childhood friend and neighbor of the Wrights, and he wrote and edited a newspaper printed by the Wrights in their printshop. For more detail of the price list, please visit the Wright Brothers Aviation virtual museum page here. Now, here’s a bit of history on the bikes themselves: when I first moved to Dayton, I was told by a bike-collecting friend that there were no known existing Wright Bros. bikes. I found that a bit surprising, so I asked the park ranger who led my tour about that. I was pleasantly surprised to learn that there are FIVE known bikes out there…one at the National Museum of the United States Air Force at Wright-Patterson Air Force Base, two at Carillon Park here in Dayton, one at the Henry Ford Museum in Dearborn, Michigan…and one other in a location I cannot recall. I’ve seen the one at the Air Force Museum with my own eyes, and it’s a beauty. 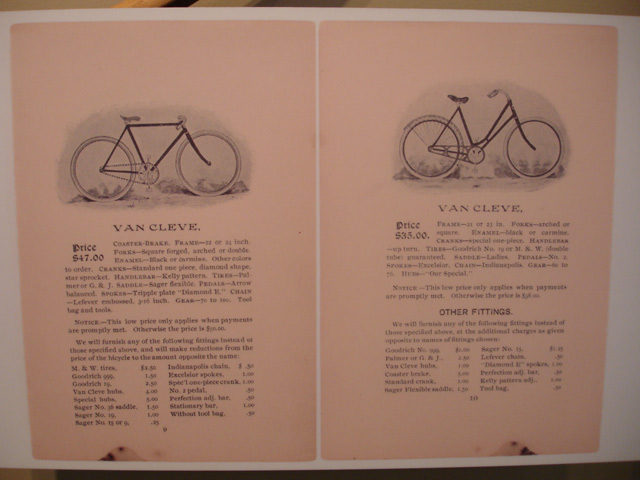 I found it a bit disappointing that this Wright Cycle Co. shop only has replicas of the bikes, not the “real thing”. But, I have to say that the replicas are stunning as well. I heartily recommend a visit to the Wright Cycle Company if you’re in the area…as well as the associated interpretive centers at the Dayton Aviation Heritage National Park complex. Visiting here reminds me of how bicycles have the power to change the world for the better. The other bike is in the Natl. Air and Space Museum in DC. Matthew, good catch! I remember now that the park ranger told me this when I asked her about the locations of the bikes. Great article, I’m glad you got to check it out. 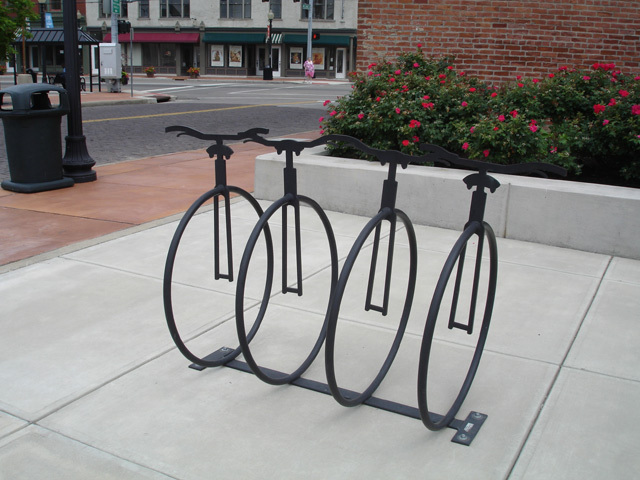 There was another Wright bicycle recently discovered this year in Ohio. 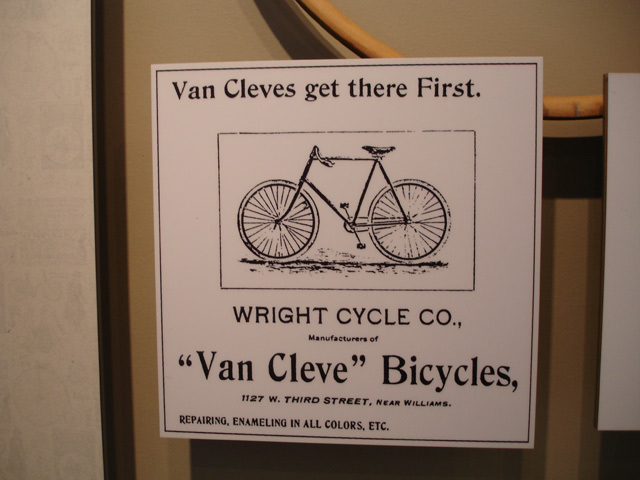 I saw it at an Ohio Wheelmen meet at the Bicycle Museum of America in New Bremen, Ohio (another awesome place to visit). It was a mess, but still had the original headbadge. CG,stay tuned for an article about the Bicycle Museum — I went there the other day, and was blown away by that collection! What an aesthetically beautiful workshop! muy buena la informacion , desconocia que los Wright, fabricaran Bicicletas.